ePublishing Knowledge BaseePublishing Knowledge BaseePublishing Knowledge Base Creating and Managing EventsHow do I market to event registrants? When new event attendees are registered on your website, they can be automatically added to an event email list. This requires that your ePublishing website be integrated with an Email Services Provider (ESP), such as Real Magnet, Constant Contact or Mail Chimp. This article shows you how to connect your event to your email lists in your ESP. Only the Event Registration Contact is added to the mailing list. Presently, any individual attendees are not added to the list. Not all event registrations require email addresses for attendees. Discuss a customization with your SM if this is something you wish to implement. 1. 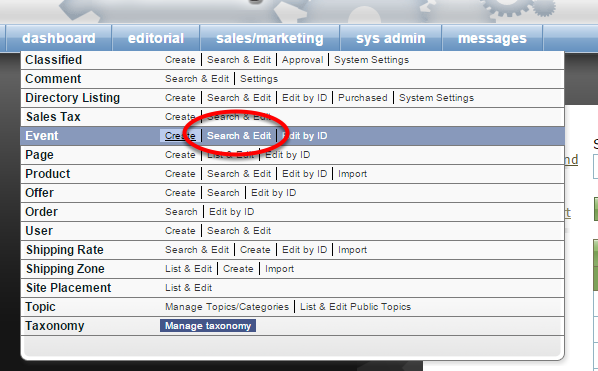 To access an existing event, click on Search & Edit next to Event under Sales/Marketing in your dashboard. Learn how to create a new event in this article: How do I create an event? 2. If your website is integrated with an Email Services Provider, add the mailing list ID number. Zoom: If your website is integrated with an Email Services Provider, add the mailing list ID number. As new event registrants complete their registrations, they will be added to this mailing list. 3. After updating your mailing list ID, scroll down and click Save. 4. To market to this list, log-in to your Email Services Provider, create a new email and select the corresponding mailing list. Prev: How do I export an event attendee list as a CSV/Excel-friendly file? Next: How do I change the order of custom event details?